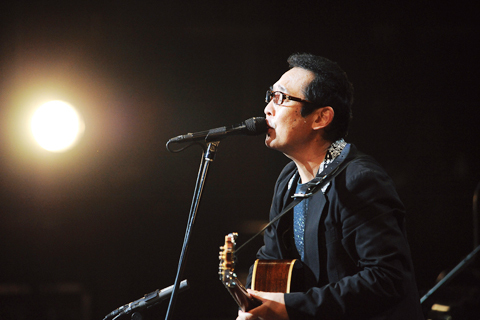 Masashi Sada is a Japanese singer, lyricist, composer, novelist, actor, and a film producer. Sada formed the folk duo Grape with Masami Yoshida in 1972, and made debut as a recording artist a year after. The pair rose to fame owing to a hit of a song “Shourou Nagashi” composed by Sada, which peaked at the number-two on the Japanese Oricon chart in 1974. They broke up in 1976, after producing some hit singles including “En-kiri Dera” and “Muen Zaka” subsequently. Sada released the first solo album entitled Kikyorai shortly after the Grape’s dissolution. Following the commercial success of the number-one hit single “Amayadori” in 1977, he enjoyed the recording career as one of the most popular Japanese male artists during the late 1970s and the first half of 1980s. Throughout his career as a musician, Sada released over 35 solo albums and 70 singles, and multiple live albums or compilations. Since the release of Shourou Nagashi published in 2001, Sada has also worked as a novelist.